Help! I’ve Fallen Behind and I Can’t Catch Up! Wow! That’s certainly not a condition or state of mind conducive to meeting with God as you read His Word! Let it go. Keep at it! Don’t let being behind schedule keep you from continuing to read. What’s the worst that can happen? 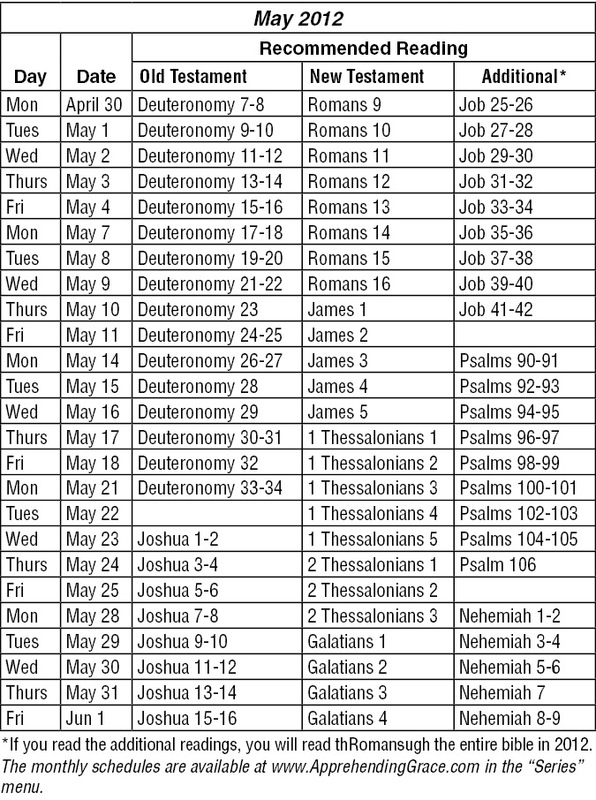 Instead of reading through the Bible by December 31, 2011, you’ll finish some time in 2012. Sounds good to me! You will still have read through the Bible and that’s the important thing. It’s not the schedule, it’s the content and meeting with God. If you’re able to add one chapter each day, you’ll catch up almost two days each week. Read three chapters on Saturday or Sunday (or both) and you’ll catch up one or two days each week. Spend your lunchtime reading your Bible. You’ll catch up at least one day, perhaps more, each time you do this. You might even decided that it’s a great way to relax at lunch! Arrive at an appointment about fifteen minutes early. Spend the time reading your Bible. You’ll catch up another day. This is a great thing to do on Sunday morning if there is a quiet place you can read before service. It really prepares you to enter into worship and the message. Carve out some “me and God” time in your schedule. This is absolutely the best thing I’ve done in my walk with the Lord and I look forward to it each week. Implement one or more of these things for a few weeks and you’ll find yourself catching up quickly. December’s reading schedule is great for this season. Don’t hesitate to stop reading where you are, read along with us in the month of December (think Revelation and Psalms), then pick up where you left off in January. Or begin following the December schedule while you employ some catching up techniques to previous schedules. Remember: It’s not the schedule, it’s the content and meeting with God! So, friends, keep at it. I commend you for all the reading you’ve done – even if you’re three months behind schedule or more! The monthly schedules will continue to be available here all throughout the coming year. Enjoy your reading and your time with God. 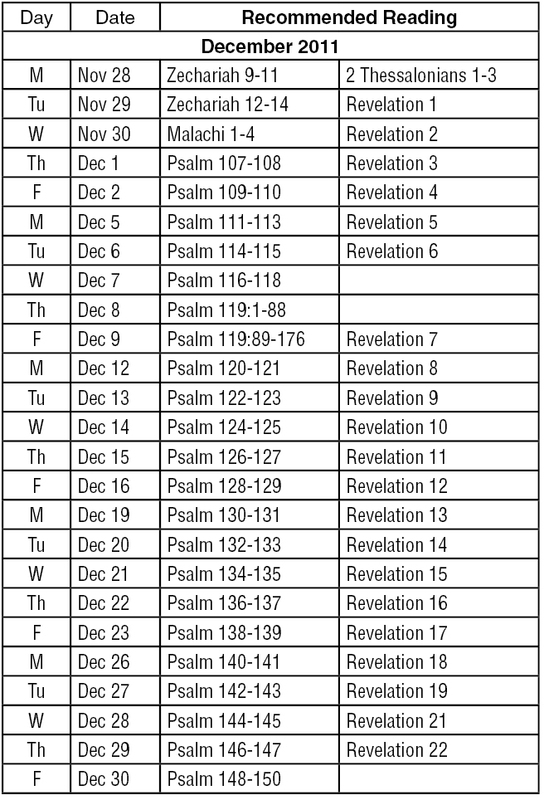 We will begin the book of Revelation on November 29th and we’ll finish it on December 29th. We will end the year reading about the future. I love that God’s Word doesn’t teach us only the Law and history and how to live in this life, but it gives us a glimpse into the future – some of which we can only imagine, and some that seems so bizarre that we can’t even imagine it. Still, He trusts us with such knowledge. Wow! Enjoy this book and if it gets too confusing don’t let it get to you! Just ask God to reveal what He wants you to understand and keep reading. What you can’t understand will simply begin to lodge itself in your spirit for the time it’s needed. 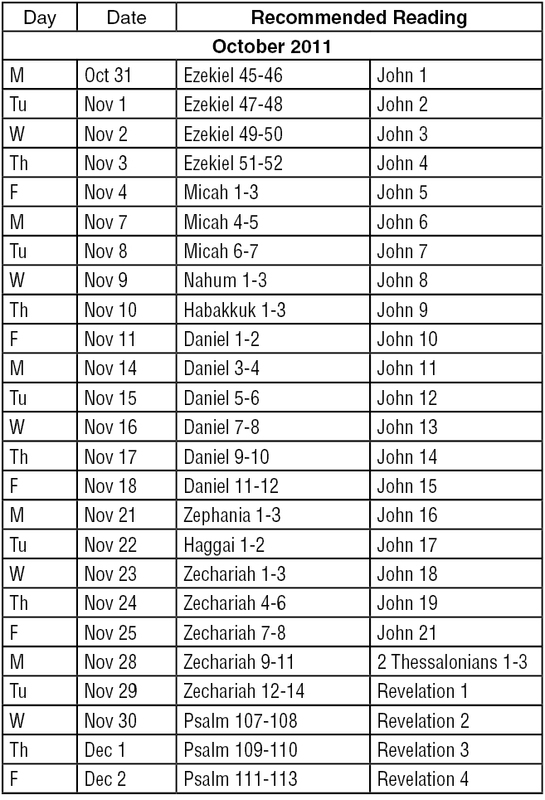 We’ll finish the minor prophets by reading Malachi on November 30th. Note that this is a slight change from the schedule that was published in November. I changed things up a bit to read the book of Malachi before finishing the Psalms instead of after. I know the month of December is a busy one for everyone, but friends – enjoy your reading throughout the month. Remember, it’s not the schedule, it’s the content and meeting with God! To download a PDF of the December 2011 recommended reading plan, click here. In the month of May, we’ll read about the passing of two great leaders: Moses and Joshua. I love their final exhortations to the people they had led for so many years. 15“Now listen! Today I am giving you a choice between prosperity and disaster, between life and death. 16I have commanded you today to love the LORD your God and to keep his commands, laws, and regulations by walking in his ways. If you do this, you will live and become a great nation, and the LORD your God will bless you and the land you are about to enter and occupy. 17But if your heart turns away and you refuse to listen, and if you are drawn away to serve and worship other gods, 18then I warn you now that you will certainly be destroyed. You will not live a long, good life in the land you are crossing the Jordan to occupy. 1The years passed, and the LORD had given the people of Israel rest from all their enemies. Joshua, who was now very old, 2called together all the elders, leaders, judges, and officers of Israel. He said to them, “I am an old man now. 3You have seen everything the LORD your God has done for you during my lifetime. The LORD your God has fought for you against your enemies. 4I have allotted to you as an inheritance all the land of the nations yet unconquered, as well as the land of those we have already conquered — from the Jordan River to the Mediterranean Sea in the west. 5This land will be yours, for the LORD your God will drive out all the people living there now. You will live there instead of them, just as the LORD your God promised you. 6“So be strong! Be very careful to follow all the instructions written in the Book of the Law of Moses. Do not deviate from them in any way. So far this year we have read two Gospels, the book of Acts and we’re half way through Romans. I placed Romans after Acts because it is such a foundational book — it appears “first in every list of the Apostle Paul’s writings [bearing] witness to the importance of the work both in its tehem and in its content.” (The Bible Knowledge Commentary: New Testament) Perhaps that why it always makes sense to me to read Romans immediately after reading the Gospels and Acts. When we finish Romans, however, our reading plan transitions. 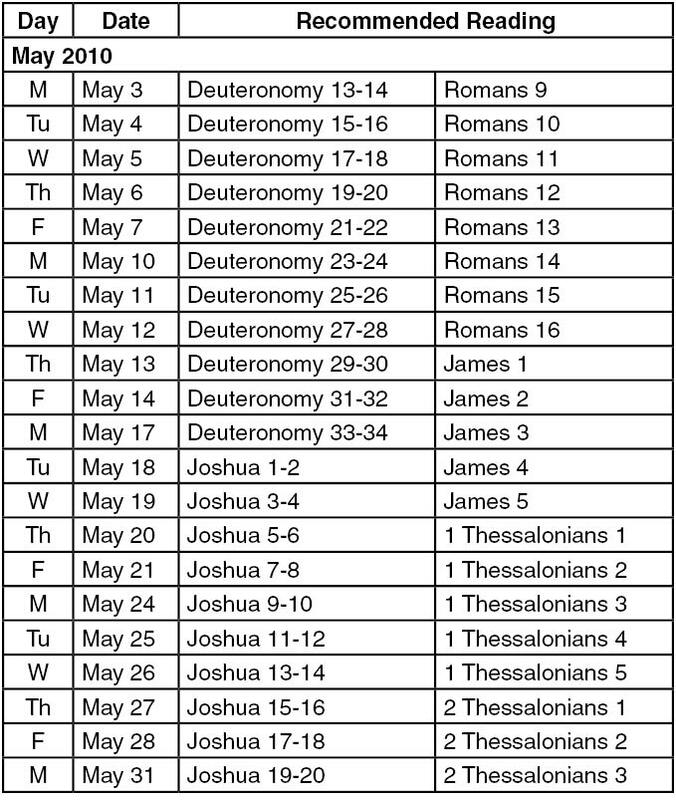 I’m doing things a bit different this year in scheduling the remainder of the Epistles based on when they were written. In other words, you’ll read the books in the order they were actually written. Of course, they were written by different people and to different groups of people, but I think it will be interesting to see the themes that the writers addressed knowing that those themes would mirror the growing new Church. Hmmm. Seems like the first issues that needed to be addressed in the Church was faithful endurance and holy living. The two letters to the Thessalonians followed much in the same theme. In 1 Thessalonians, Paul encouraged perseverance in the face of persecution and he addressed some more issues in which the church that had cropped up in the church. 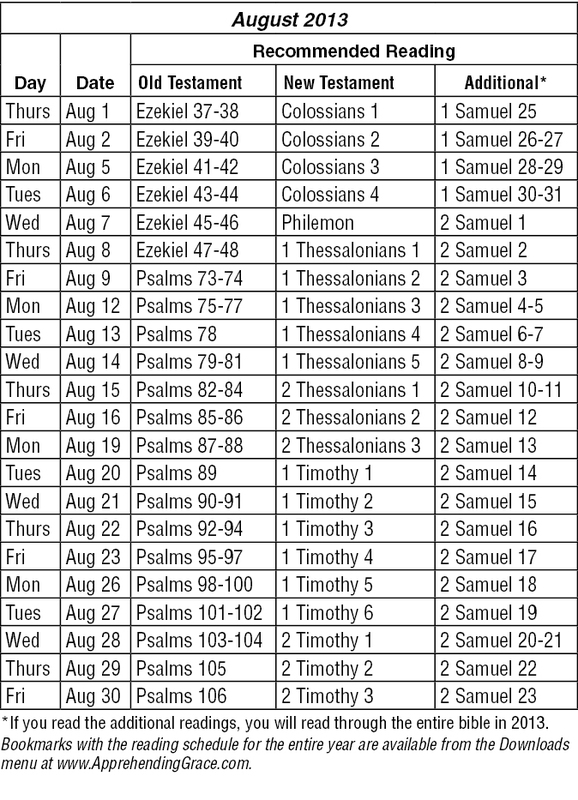 2 Thessalonians was most likely written shortly after 1 Thessalonians. Some suppose the information came to him from the person who delivered Paul’s first letter. Paul commends the church for their faithfulness and exhorts them to continue in faithful living, not abandoning responsibilities because they expected the Lord to return soon. 12Dear brothers and sisters, honor those who are your leaders in the Lord’s work. They work hard among you and warn you against all that is wrong. 13Think highly of them and give them your wholehearted love because of their work. And remember to live peaceably with each other. 15See that no one pays back evil for evil, but always try to do good to each other and to everyone else. 16Always be joyful. 17Keep on praying. 18No matter what happens, always be thankful, for this is God’s will for you who belong to Christ Jesus. 19Do not stifle the Holy Spirit. 20Do not scoff at prophecies, 21but test everything that is said. Hold on to what is good. 22Keep away from every kind of evil. May the Lord of peace himself always give you his peace no matter what happens. The Lord be with you all. To download a PDF of May’s recommended reading plan, click here. Note: There are many references to Scripture in this blog. All are to the New International Version (NIV) of the Bible unless otherwise noted. In each of these cases, the word translated “called” means “ongoing (or continuing) choice.” It is the derivative of a word that is also translated “called” but refers to the single act that is done or has been done. Looking at this word gives us more insight into our calling. Read over this list slowly to understand who you are in Christ and what you are called to do or be. That’s quite a list! As I created the list there were several items that caught my attention. Rather than talk about them, let me give you an example and a challenge, then offer an encouragement and a prayer. The challenge: Read over the list prayerfully. Which of the things you are called to would God like you to experience more fully? Make it a part of your daily prayers for the next two weeks. The encouragement: God doesn’t call us to anything He cannot give us or enable us to experience. If He has highlighted one of these “callings,” it is His desire to help you attain it. The prayer: I pray that this week you will apprehend the grace that God has for you. And I bless you with a supernatural ability to see God working in your life as you pray to bring about His calling this week.